"They really don't want you here." "It's a shame, if only they'd got to know me." 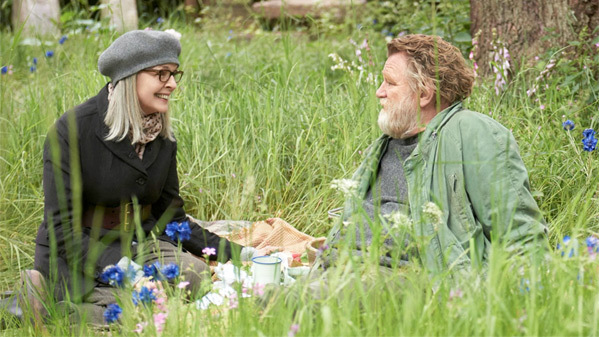 An official UK trailer has debuted for a romantic drama titled Hampstead, taking place on Hampstead Heath, a large grassy public park in London. The film stars Brendan Gleeson as a man living in the wild in a hand-built shack in the park. An American woman, played by Diane Keaton, meets and falls in love with him and joins in his fight to save his home. The full cast includes James Norton, Jason Watkins, Lesley Manville and Alistair Petrie. This looks like a quirky, charming, totally-British romantic drama that may win over a few people. An American widow (Diane Keaton) finds unexpected love with a man (Brendan Gleeson) living wild on Hampstead Heath when they take on the developers who want to destroy his home. Hampstead is directed by English filmmaker Joel Hopkins, of the films Jump Tomorrow, Last Chance Harvey, and The Love Punch previously. The screenplay is written by Robert Festinger (of In the Bedroom, Trust, The Procession). The film is set for release in the UK + Ireland starting on June 23rd this summer, but it still doesn't have any US release date set yet. For more info on the project, visit the film's Facebook page. First impression?